In the high, remote elevations of California's White Mountains, you will find a small group of ancient pine trees, known as Bristlecone Pines. The Bristlecone are thought to reach ages far greater than that of any other known single living organism — up to nearly 5,000 years. Bristlecone pines grow in isolated groves at and just below the tree line. Because of the unique combination of elements – cold temperatures, dry soils, high winds and short growing seasons – they grow very slowly. Their wood is quite dense and resinous, thus resistant to invasion by insects, fungi and other potential pests, contributing to their remarkable longevity. 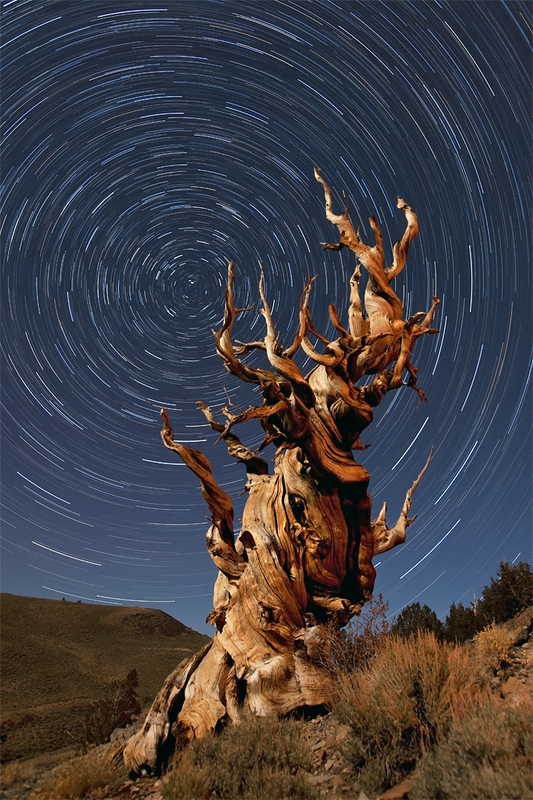 This photo captures one of the larger twisted trees at the 10,400 ft. elevation, which was illuminated by the moon's casting a soft nighttime glow across the landscape. The enchanted night effect of the star trails were shot using a 1-hour long exposure pointed directly at the North Star (Polaris).